Iranians protested for the third day in a row and held a massive protest in central Tehran amid calls in most Iranian cities and provinces to protest on Saturday afternoon. Activists on social media shared videos and photos of protestors who gathered and walked in Enqelab Street in central Tehran and chanted to fellow Iranians to support them and join their protests. Dozens of students at the University of Tehran also gathered in front of the university’s entrance and chanted: “The reformists’ and fundamentalists’ game is over.” Some social media pages and Telegram channels that are reporting protests in Iran said dozens protested in Karaj, south of Tehran. “Unlike other protests in various cities which were against the economic situation and high prices, the one in front of the University of Tehran was political,” Fars news agency said. The students repeated a popular chant of “Not Gaza, not Lebanon, my life for Iran”-- an expression of anger over claims the government is focusing more on regional issues than problems at home. There is discontent over unemployment, rising prices and alleged corruption. The protests have also turned political over issues including the Islamic Republic’s involvement in regional conflicts such as those in Syria and Iraq. Unemployment has risen and annual inflation is running at about 8 percent, with shortages of some foods also leading to higher prices. Other videos shared on social media showed people protesting in Isfahan, in Shahr-e Kord, in central Iran, and in Kermanshah, in west Iran. Clashes with the police were reported in Shahr-e Kord. Security forces also used tear gas bombs against protestors in Kermanshah. Hundreds of people gathered at Dorud (Lorestan Province) and chanted: “Death to the Dictator (Ayatollah Khamenei)”. “The police and the judiciary tried not to turn these protests into a worrisome case,” he added. In a statement issued Saturday, the Iranian Revolutionary Guards (IRGC) accused protestors of implementing a “western agenda against the regime” and accused Britain and the US of standing behind the protests which it described as a new attempt to incite “sedition. It also called for confronting protestors by holding protests in support of the regime. Earlier on Saturday, authorities organized protests in support of the regime in several cities. This brings to mind similar protests which the regime organized on December 30, 2009 when the Iranian Green Movement held anti-regime protests which were violently suppressed. 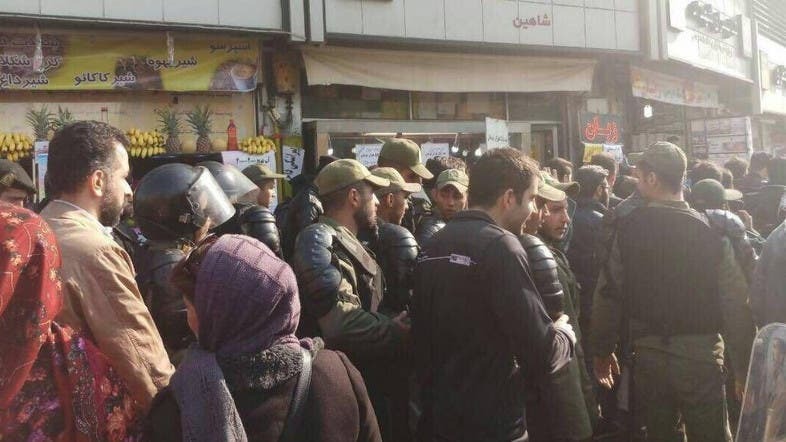 Protesters in the #Kashan (Isfahan Province) also took down a poster of Khamenei, Iran’s Supreme Leader. Iranian opposition figure Maryam Rajavi greeted Iranians protesting against the dictatorial and repressive regime in Tehran on Saturday – the third day of widespread protets in the major Iranian cities around the country. “We salute the heroic protests of citizens in Khorasan, beginning with the uprising in Mashhad and protests in Shahrud, Kashmar, Nishapur, Sabzevar, Quchan, Bojnord and other cities,” she tweeted. “I salute the heroic men, women in Shiraz whose slogans terrified the Iran|ian regime,” she said in another tweet. She also tweeted video of police beating protesters in Kermanshah. 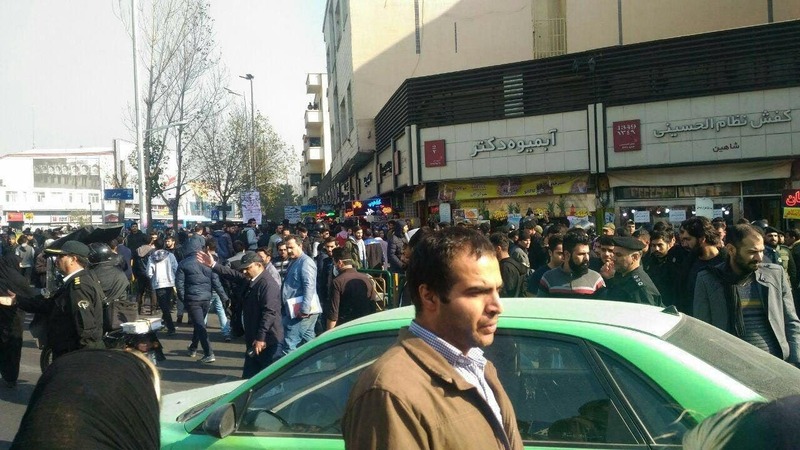 The economic protests began on Wednesday nd have drawn thousands into the streets in several cities in Iran. Officials say some 50 protesters have been arrested. US President Donald Trump has tweeted out support for those protesting. The US State Department late Friday also offered support to the protesters.